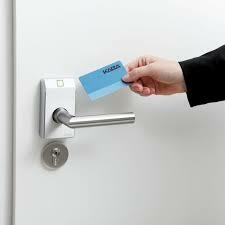 FC Locksmith > Blog > Articles > Access Control Systems > Are Electronic Locks Smart Enough? Are Electronic Locks Smart Enough? Did you sense the bedroom lights flashing in the middle of the night? There is nothing wrong with your lamps but simply a warning that someone is breaking in your house right now. Electric devices talk to each other in smart homes and if being warned by an alarm about leaving your refrigerator open doesn’t interest you, you might want to know that your bedroom flatscreen will be turned on in silent sound when perpetrators are lock picking your front door. Such interactive systems that will allow electronic home devices to talk to each other are not exactly futuristic plans. 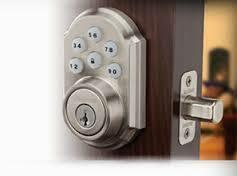 New smart electronic keyless security door locks have tremendous capacities and soon will swamp the market and our homes. The simplest models are smart enough to be operated with personal codes. You just enter your code and enter your home with safety and speed. Do you want something smarter? Get biometric door locks, which will either work by recognizing your own fingerprint or also adding a two digit code. It’s the end of the key era. No more office lockout, no more searching for the keys, no more dealing with broken and distorted keys. Electronic locks are even smarter from your children. They will definitely be secure since they will not be able to twist the button of the knob to exit the premises but they must know the code. Smart electronic access systems are perfect for hospitals, sport stadiums, huge corporations and organizations. In such establishments, the security system is chaotic. Think of what lost office keys might do to employees of a corporation preparing to welcome their biggest client! Think of the relative consequences in a hospital when nurses cannot enter the medicine storage room because the keys were lost. Large places like stadiums with many restricted areas for both supporters and staff couldn’t manage without keyless systems. Many of these systems will lock with a single pressing of a button or just be closing the door behind you. They will unlock if they detect fire or smoke in the premises. Codes are changed easily and you can also grant one for your family visiting from out of town. It will be different from yours and erased easily afterwards.